This healthy and delicious meal is comforting on a cold day, and because it’s all made in one skillet, it’s a beautiful but stress-free dish to serve the whole family! Being back on the meal planning wagon feels SO good. You can see this past week’s meal plan here. Not only has our nutrition felt back on track, it’s been a good thing for our budget too. The increased number of vegetarian meals we are eating significantly lowers the bill. Another way to cut costs? Buying less expensive cuts of meat! I try my best to seek out the grass-fed beef and pasture-raised chicken when I can, but that means paying a premium. 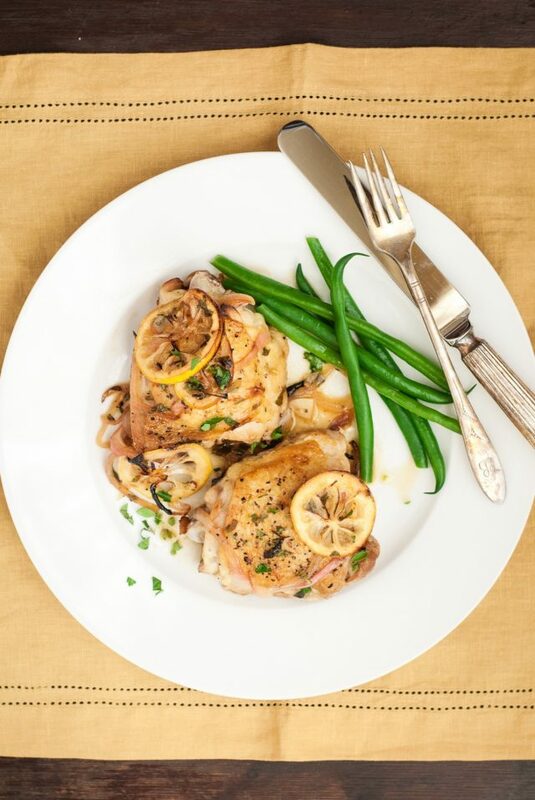 However, opting for the less expensive premium meats, like chicken thighs over the typical boneless skinless chicken breast, not only saves money, it also adds more flavor to the dish! For the longest time I didn’t buy fresh herbs because I thought they were a waste of money, but the freshness they bring to a dish is worth the extra $2-$3 in my opinion and now I find myself buying parsley, cilantro, and a different “specialty herb” each week. In this case, oregano, but you could always substitute the 2 Tbsp of fresh oregano with two tsp of dried oregano if you’d like. 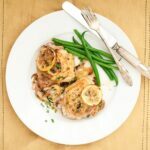 These chicken thighs with fresh oregano and lemon is a perfect dish for the cold weather we’ve been experiencing. 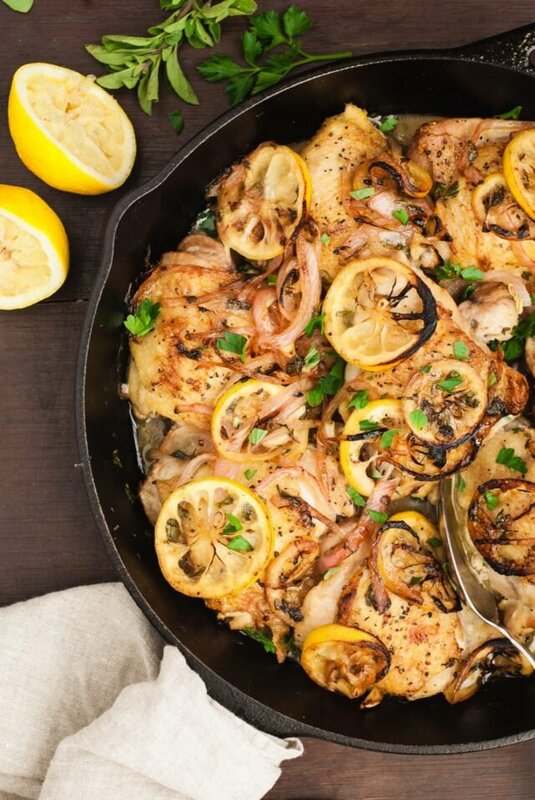 It’s also a great choice for the whole family and because it’s made in a single skillet, clean up is quick, making it a great weeknight option! Just throw some veggies on the side, and maybe some rice or bread to bulk it up, and voila– dinner is served. It looks fancy, but is simple to make. I hope you enjoy it! As always, if you make one of my recipes, please share it with me by tagging me on Instagram and/or using the hashtag #AHSintheKitchen. It always makes me so happy to see you making these meals for your family! Thinly slice 2 lemons; set aside. Juice remaining lemon; set juice aside. Heat olive oil in a large iron skillet or oven-safe skillet over medium-high heat. Add chicken thighs in two batches and cook on each side until thighs are browned, about 5 minutes each side. Remove chicken to a plate. If necessary, pour off excess pan juices, leaving about 1 tablespoon remaining. Return skillet to heat. Add lemon slices and slivered onions to skillet; cook for 3-4 minutes or until lemons and onions begin to brown. Add garlic, oregano, and parsley to pan; cook for 2 minutes. 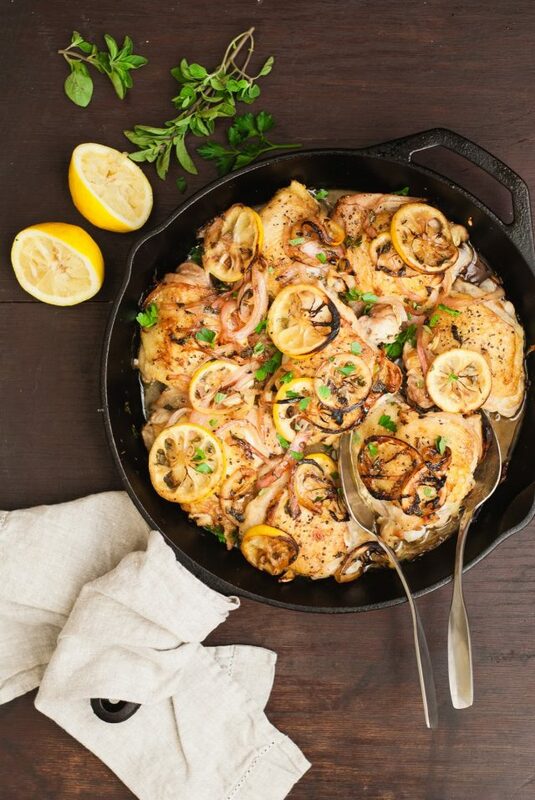 Return chicken thighs to pan, nestling onions and lemons on top and around thighs. Pour reserved lemon juice over mixture. Sprinkle with additional fresh oregano and parsley to garnish, if desired. I recommend using organic lemons because the rind will be eaten in this dish. However, if you can’t find organic or prefer not to purchase them, conventionally-grown lemons are fine! That looks amazing and something my husband would like! Thank you for another great recipe! anything with lemons and parsley! i might do this and add olives & capers. yum! Looks delicious, I will definitely try! Also, have you tried growing your own herbs then transferring to pots (indoors) for winter? I moved my perennial herbs inside in October (Colorado) and they are still taking off (rosemary, oregano, thyme, mint, sage). Some herbs like rosemary are hardy down to 20 degrees if left outdoors. I should definitely try and grow herbs inside– I love that idea! Hi! Looks beautiful will have to try soon! Totally unrelated, but you got me started on boot camp and just got a deal for $72/month, unlimited so I just signed up for a year. Yeah! Love it! Have a great weekend. Oh my gosh what a GREAT deal! That is awesome! I was raised on chicken thighs and stopped eating them for most of my 20’s but have since gone back to chicken thighs. I’m sorry but they have SO much more flavor than the breast. Anytime we roast a whole chicken I always call dibs on the thighs. 😉 This looks so good and Whole30 approved, I believe so I’m going to add it to my menu for next week. Also, I have fresh oregano in my “garden” so I should really use some of it! Made this last night—so good! This was great! The whole family loved it. And, it made my house smell good!